MPLAB® IPE's Blank Check feature allows you to check if the target device's programming memory contains any code or not, i.e. whether the device is blank or not. Short-cut key combination Alt+F9 is available to perform Blank Check operations. For detailed information on the IPE's Command Buttons short-cut keys, please refer to the Launching the IPE Application page under the section IPE Main Window Fields. 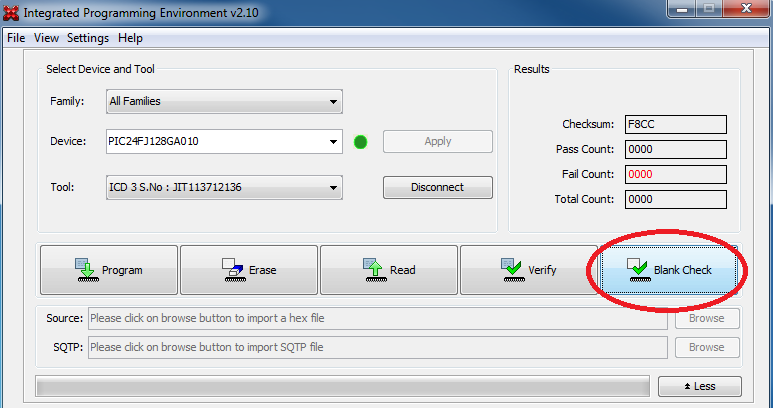 By default, the Output window is shown after the IPE is launched. To minimize the Output window, click Less (see figure below). The Output window will automatically shrink and disappear. To bring the Output window back, click More, as shown below.